SkullandBonesSkateboards.com ~ View topic - Vinyl cut gonz colour my friends! SkullandBonesSkateboards.com Forum Index » SKATEBOARD ART » Vinyl cut gonz colour my friends! I've been playing around with a new vinyl cutter, hopefully just place holders until a Og turns up. Great fun getting up close and personal with gonz artwork. Wow, coulda fooled me! Those look legit from here. You could use that to make stencils for paint too. Hey swellbow, I've tried loads of mediums recently, Belton spray is great for stencils and the colours are nice, tried acrylic with rollers, watercolours. I haven't tried using the vinyl on a blank silk screen for printing yet? Not sure if anyone on here has tried that technique out. Loving the vinyl as hopefully it's not gonna upset anyone and if I get bored I'll strip it down and cut some other colourway. 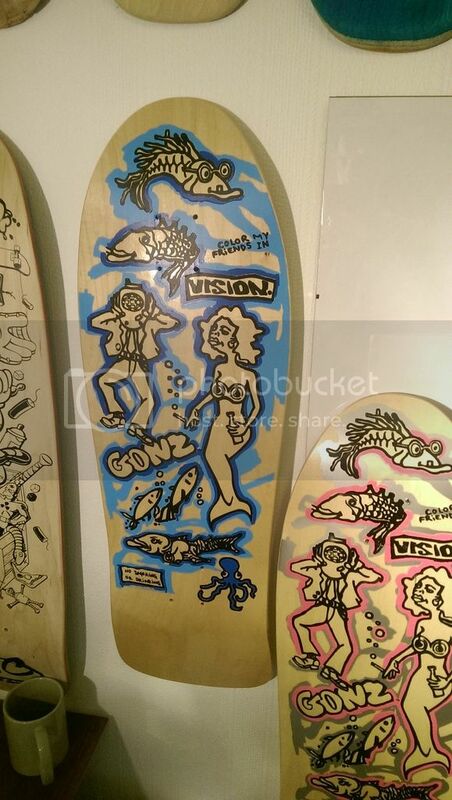 This is an OG Gonz deck that's been restored. Was wood stained, and now is Red dip! Any feed back? Looks great on an original shape, I need to shave off the flare on the tail and square up the nose on the blanks I used, great job 80's I would really appreciate a high res pic of the top graphic if it's not too much hassle. Nice colourway is it original? Daggers, you have done a FINE job. Way to go! The Gonz I posted is my buddies deck. It is an original wood stained Gonz, that he (Matt) has restored into a Red dip. It's 100% hand painted. Matt is having a hard time trying to get on SNB so he ask me to post it. I'm thinking I should have posted it in a New Thread, as I do not want to take away from your amazing hard work. No worries 80's share them gonzes! It's been great fun reworking classic deck graphics up close.